getting more bang for their buck. can achieve these temps without melting the gasifier! The charcoal acts a bit like a catalyst helping to pull the bits apart. I might still have a book that studied town gas and got into the details however at this time I have a problem getting to it. The water gas shift is an endothermic reaction. Part of the reason we add water is to cool the reaction zone down to an optimal level. If we add hotter steam we can use more and create more H2 and free oxygen for richer gas. Theoretically, to make 6 L of water gas, 5 L of air is required. Or, alternatively, to prevent contamination with nitrogen, energy can be provided by using pure oxygen to burn carbon into carbon monoxide. In this case 1 L of oxygen will create 5.3 L of pure water gas." Thank you, Koen, it’s beginning to make some sense now. 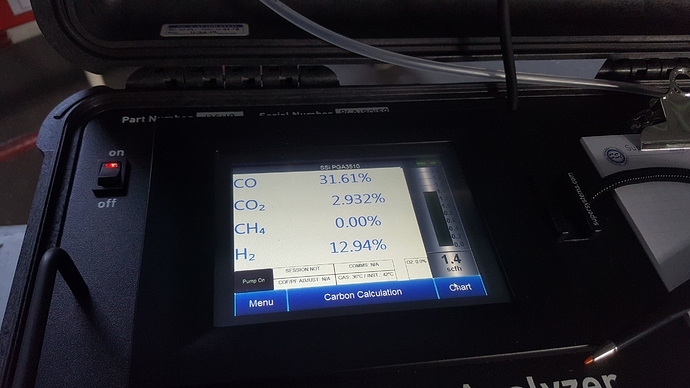 the soon as my computer gets back from repair , i will upload a clip where i show the H2 % increasing with adding water in the glowing carbon. Koen, Isn’t it great to have those kinds of tools!!! That is so cool! @k_vanlooken can you get me a link to where I can get this analyzer? Im thinking of using 1/4" copper pipe. On the last run thermocouple #1 was between 970 and 1400F (520-760C). I think this might help keep my gas temp down, and I also suspect that having some hydrogen would really up the gas quality. Any thoughts? If you can get the steam up to twice the boiling point under manageable pressure of about 40 PSI or less that would be both safe and manageable. I think the best place to do this is off the exhaust of the engine. This way steam production is somewhat regulated by the amount of load on the engine if you see where I am going. You could try and super heat the steam produced in a coil off the gasifire but I don’t know how much heat and pressure this could make. The flow and pressure would depend on the jet size you chose for the injector. Yeah feed from your condensate tanks to be self sustaining. Im going to play with this as well. Might do steam direct injection into the engine along with a lower charcoal reactor steam injection system. No more daily ash removal. Goal will be to get to a two week or longer char ash servicing interval. Not so sure thats much help Matt. Wood has more moister locked up in the cellulose than we need. Even bone dry wood has more than enough moister to fully convert in the water gas shift. Now if you could increase the temperature and pressure at the same time in the reduction zone ( operate above atmospheric pressure ) then I bet you could add more water/steam. Doug Williams eluded to an issue with some tropical hard woods being so dense and hard they burned like coal and these did need some extra water to control the temperature. What I mean is for the water supply for steam injection. My thinking is different because Im thinking in terms of wood gasification vs char coal. So in my system I would not be injecting the wood gasifier, I would use any moisture it created to feed the charcoal unit in its lower to control its heat. The problem for this concept; is the new pellet reactors have a very near 100% water shift. I showed the guys at Argos last year, what it dropped after running all day. Only a table spoon of condensate after something like 8 hours running non stop. Core temps are beyond steel melting point in this reactor. How I am getting away with this is because when these temps are reached is after the bottom of my restriction. Its just open at this point no metals come in contact with the gas at this temp. From here we start the endothermic reactions and the gas is much cooler by the time it reaches the grate. While Im on this subject. my gas exit temps are much higher. The reason this is note worthy, is because dry gas is much much harder to cool than gas full of moisture. No we dont have failures. This is easy!! One great thing about the folks on the DOW forum, they fire up my curiosity and cause me to research and learn new things continually. You can teach an old dog new tricks, if the dog is willing! I followed links which added up to more links. Read a bit about Fischer-Tropsch and Thaddeus S.C. Lowe. Learned about Hydrogen, and superheated steam. Hot carbon and coke. Ammonia and methane. Early refrigeration. Steam reforming. Thanks to all! If the gas has nothing to give it stays hot.